The Mexican military holds dominion over the 600-mile highway from the U.S. border to San Ignacio Lagoon, making the road toxic to criminals. Soldiers carry rifles, strap knives to their hips and dress in heavy camouflage, ignoring the desert heat. They stopped me, a harmless gringo, at a half-dozen checkpoints on my journey south. They lifted the lid on my cooler and scoured my trunk, ensuring I wasn’t harboring drugs. They had just one question: “A dónde vas?” “Ballenas,” I replied, and they grinned, appreciating that I appreciated the whales. They let me pass, and I continued through the desert to San Ignacio. Gray whales leave their homes in the frigid Arctic each winter and make the longest mammalian pilgrimage on Earth, traveling around 6,000 miles to shallow, balmy lagoons along Baja California. Here, the whales give birth to 15-foot long calves before swimming back north, threatened by hungry killer whales along the way. The whales’ motivations for such an arduous journey may seem simple — the lagoons provide safe places for whales to mate and give birth — but not everyone is convinced. Before his death in February 2017, I listened to John Stern, a whale researcher at San Francisco State University, speak about the migration. With gray and frazzled scientist’s hair, like that of Back to the Future’s Christopher Lloyd, he cautioned that we still understand so little about a species who spends most of its life hidden beneath the oceans — even though some whale literature may tell us differently. “Beware of what you read in books,” Stern said with a wry smile. The mysterious behaviors of whales continue to intrigue us, sometimes in unexpected ways. In the last few decades at San Ignacio Lagoon, the smart mammals have regularly sought interactions with humans, swimming over to 20-foot long panga boats and letting eager human hands reach out and touch them. To lagoon natives and visitors alike, this inter-species socialization is described as “friendly,” and having greeted the whales myself, I agree. Such comfortable socialization wasn’t always the case. Historically, the whales shared these salty inlets with fishermen, and both species avoided each other. “The whales were called “devil fish,” says Jesus Mayoral, who lives at the lagoon today, and whose father fished these waters his entire life. Until the 1970s, fisherman kept their distance from the massive, intimidating creatures. “During the days of whaling, the females would protect their young by ramming and sinking boats. Many residents of the lagoon still remembered those days, as did the whales,” Mayoral says. But on a February morning in 1972, the mutual avoidance ended when Mayoral’s father, Francisco “Pachico” Mayoral, and his fishing partner Santo Luiz Perez, were approached in the lagoon by a gray whale. The whale swam under their boat and emerged beside it, huffing misty air from its blowhole and exposing its great head. Sensing that the devilfish meant no harm, Pachico reached out his hand and gingerly placed it on the whale’s rubbery skin. This marked the first documented friendly encounter between whales and humans at San Ignacio Lagoon. 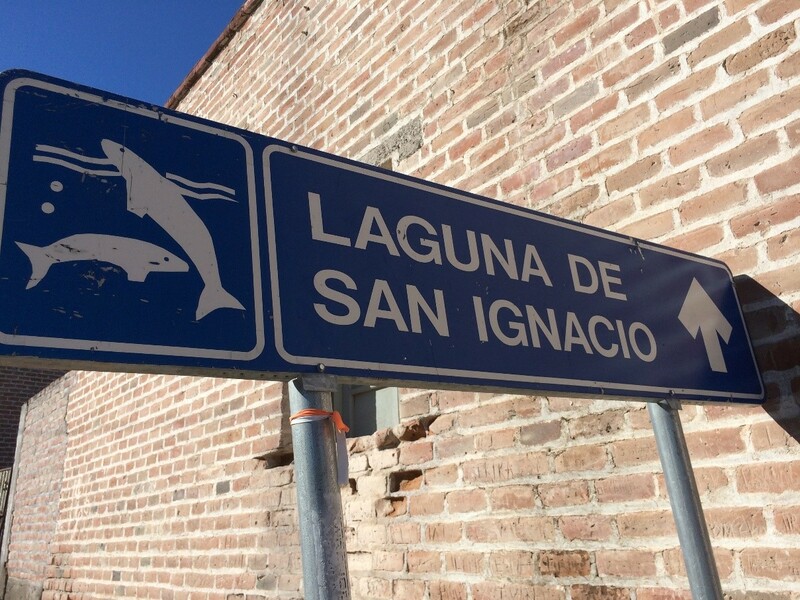 Today, the lagoon lies protected in El Vizcaino Biosphere Reserve, a Mexican wildlife refuge where the government minimizes the human presence in the whale-rich waters. Each day, from January through April, a limited number of pangas are allowed into the lagoon, under the rule that the boats cannot approach the whales, but the whales can approach the boats. And they frequently do. 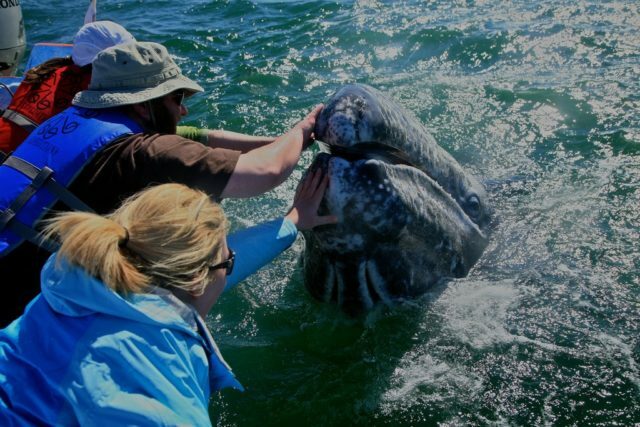 A gray whale calf initiates a friendly encounter in San Ignacio Lagoon. In 2015, I boated into the lagoon with Pachico’s son, Jesus Mayoral, and over two days, experienced eight friendly encounters. The most common visitors are mothers with their newly born calves. It seems counter-intuitive and dangerous for a mother to so blithely expose her young to another species — especially one that has been historically murderous. She swims beneath the boat and turns over, exposing her porcelain underside to the desert sun. She surrenders, showing total vulnerability, opening up her soft belly to a deluge of harpoons. Fortunately, the harpoons never come, just human hands. This, I learned, was enough to persuade her bashful, uneasy calf to come alongside the boat. The differences between our species are obvious, yet we are both intelligent, social animals with a shared desire to meet each other. The two-day drive to San Ignacio Lagoon winds its way through the strange Mexican desert wilderness, where motorists pass through fields of cirios, whimsical, towering plants, sticking out of the ground like two-story upside down carrots. Passengers bumble past dusty villages rife with chickens, cerveza, and tacos, and as noted earlier, military checkpoints, which keep roadside malice at bay. Most lagoon visitors choose a quicker route, flying into the town of Loreto and then make a four-hour drive to the water. Once there, about a half-dozen eco-tour camps will bring you into the whale-rich shallows. Pachico Mayoral, who experienced the first documented friendly encounter, died in 2013, and his son Jesus continues the family business, Pachico’s Eco Tours. Out on the lagoon, misty whale blows shoot up around you, a slightly unsettling minefield of spouting sea, reminding you of the massive creatures lurking beneath the surface. All day Jesus is asked, “Why do the whales come here?” The simple answer, that the lagoon provides a safe place for whales to mate and give birth, is not one Jesus — a whale expert without a diploma — gives, nor necessarily believes. “What do you think?” he replies. Perhaps they choose to be on the move, to prevent too many barnacles from attaching to them? Perhaps, by approaching us they are sending a request to help clean them of some of the barnacles? In addition, perhaps they travel the seas to equalize our planet and send us much needed peaceful loving vibrations?